In Athletic Physical Education, students will do advanced skill development, physical fitness, and weight training. Sports offered in Athletic Physical Education include: Baseball, Softball, Boys Basketball, Boys Tennis, Boys Golf, Girls Basketball, Girls Tennis, Girls Golf, Cross Country, Gymnastics, Track and Field, Football, Girls Volleyball, Boys Soccer, Water Polo, Girls Soccer, and Wrestling. This course may be repeated for credit. Prerequisite: 9th grade PE, 10th grade PE, successful completion of Biology. This course is designed to introduce students to the exciting career of sports medicine. Students will gain an understanding of basic health concepts; the general structure and function of the human body; the psychology of injury, illness, and care; assess vital signs; and obtain medical history. Topics of study include: recognition & prevention of injury, treatment, injury assessment, rehabilitation, emergency care, nutrition, first aid and CPR. A lab component, in which student interns assist the Logan Athletic Trainer, will introduce students to taping, wrapping, splitting, and evaluation/response to emergencies. Students will also have an opportunity to become certified in first aid and CPR. This course may not be repeated for credit. The Marching Band and Auxiliary prepare for performance in this class. During the fall competition season, practice will continue after school until 5 pm one to two days per week. There are also two nights of rehearsal from 5 pm - 9 pm. Fall performances will include all home and some away Logan football games, field show competitions and parades. The winter schedule includes Winter Guard performances. Spring performances may include parades and field show competitions. Many of these events take place at night and on weekends. The Marching Band travels to many away performances, and the band serves as Logan's and Union City's representative all over the state. The Marching Band will attend a band camp at the end of August. Homework will be assigned weekly. Pre-camp rehearsal will be held at Logan in July and August. This course may be repeated for credit. The ninth grade physical education program introduces students to activities that emphasize fundamental skill development, physical fitness and participation. Activities in the ninth grade program provide students with an understanding of the need for a program of lifetime fitness and good nutrition, as well as a proper body composition, appropriate ways of handling stress, and an appreciation of lifetime sports and activities. Students will participate in a minimum of eight activities that incorporate one of the following five strands: individual sport, team sport, combative sport, aquatics, and movement. Activities will be assigned according to staffing, available facilities, and the time of year. Class activities will include lectures; demonstrations and appropriate handouts; study guides; videotapes; and individual, group and team drills. 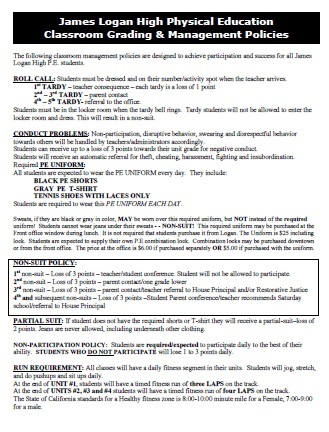 Each activity unit will include student skills demonstrations and written evaluations covering rules, strategies, terminology, safety procedures, and scoring. Students are also required to take the state physical fitness test in April. This course may not be repeated for credit. Prerequisite: To have taken one year of ninth grade Physical Education. Activity units in the tenth grade physical education program emphasize skill development, team play, lifetime sports, physical fitness, participation and an understanding of the need for lifetime fitness. Courses taught in this course include Archery, Frisbee, Indoor Soccer, Street Hockey, Tennis, Volleyball, and others. This course may be repeated for credit.